Use your debit or credit card, or PayPal, to make a donation to support our work. Click the Donate button to start. Here, people face another hazardous journey navigating the complex and hostile legal system in order to be safe. Without help, many will be forcibly sent back to the wars, persecution or hardship they have fled. There are increasing obstacles – legal, procedural, social and economic – that stop people being able to establish their right to remain in the UK. Asylum seekers and other undocumented migrants live precarious lives, at risk of homelessness and destitution, indefinite detention or forced return to countries and situations where they may be in extreme danger. With donations and regular giving, we can continue to provide our unique and urgent work, which is in more demand than ever. We provide information and resources to groups and individuals to help them establish their right to remain. Our main resource is the Right to Remain Toolkit, empowering people with knowledge about the legal process and understanding of how to get help and support – it’s a vital guide that will help save lives. We deliver capacity-building training, workshops and meetings with grass-roots groups and networks, so that people aren’t going this intimidating and harmful experience alone. And we bring campaigners together to bring about positive change in the asylum and immigration process and build a movement for migration justice. A regular standing order from your bank is the best way to support Right to Remain financially. It doesn’t matter how much, and it’s easy to set up. Just contact us, and we’ll send you the details. Already, quite a lot of people support us with monthly standing orders, and we are incredibly grateful for this committed giving. But we need more people to join them. So please consider if you can join the group who underwrite our work with a monthly standing order: £10 a month would be great, more would be fantastic if you can afford it, but even £2 a month from lots of people would quickly make a real difference to our sustainability to continue our unique and vital work. You can set up a standing order by contacting your bank, or through your online banking. If you can’t set up a bank standing order, you can make a one-off donation. Right to Remain, c/o Praxis, Pott Street, London, E2 0EF. T-shirts now available to buy online. Support our work defending the rights of refugees and other migrants. We empower – through our training workshops with people seeking the right to remain in the UK and the grassroots groups and networks supporting them, we empower people to fight for their rights, and mobilise people in solidarity with their struggle. 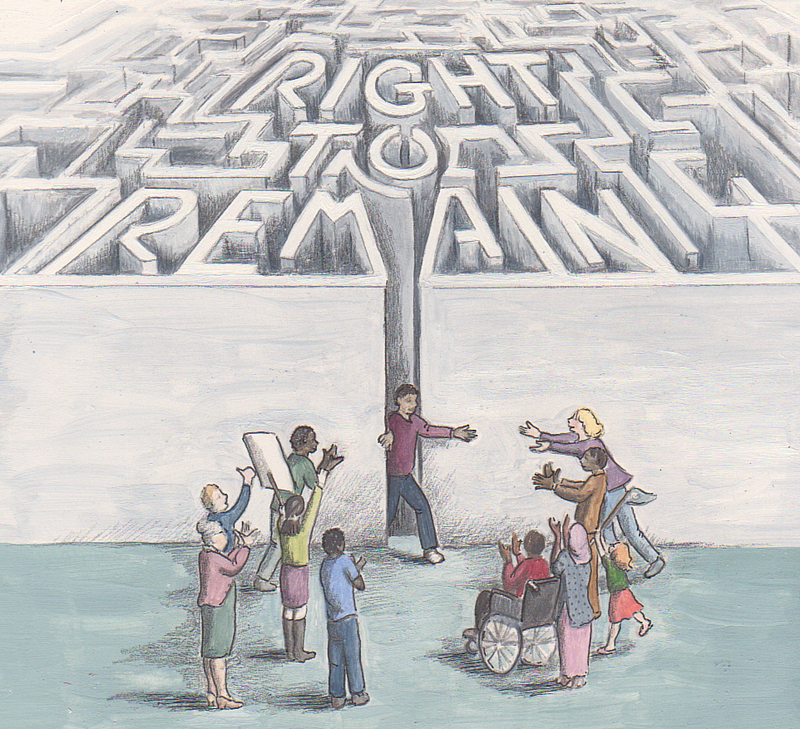 We inform – our very popular Right to Remain Toolkit and other online resources help people navigate the complex and ever-changing asylum and immigration system, and take action to establish their right to stay. Through social media, our blog and our email updates, we share the human impact of unjust laws and policies and provide the tools for people to call for change. We inspire – through our meetings, workshops and national gatherings we convey stories of positive practical action for migration justice, enabling those who have been effective to stand up and share their stories. We support and encourage – bringing campaigners together to increase the effectiveness of their work, building our mutual solidarity.